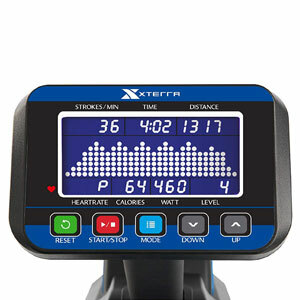 As opposed to the ERG500 model that we’ve previously reviewed, the XTERRA Fitness ERG700 is equipped with a magnetic resistance system. Its internal magnetic brake serves to enhance the difficulty generated by the machine’s flywheel. In other words, it’s an air and magnetic resistance rower. Although it’s not advertised and sold as a commercial-grade machine, it’s range of features and overall quality are pretty close to at least a light commercial unit. The XTERRA ERG700 combines steel, aluminum, and ABS parts in its frame construction. Its rail is made of aluminum, the front part that sustains the fan and the rear stabilizer are made of steel, while the covers of the resistance elements are made of durable ABS material. All metallic parts are coated with a corrosion-resistant and chip-resistant paint finish; the color used is light gray, with the XTERRA logo painted blue. These are the only colors available for this unit. This XTERRA rower is fairly large, especially lengthwise. With the frame fully set up, it measures 97″ (246 cm) in length, and approx. 18″ in width. Along with these dimensions, you also have to consider a few extra feet of clearance (at least two feet at the rear and on the sides, and at least one foot of clearance at the front) for safe operation. Therefore, this machine may not exactly be the best choice for a small room or apartment. On the other hand, the unit’s frame can be folded. The rail folds up, and with it folded up, the machine’s length is reduced to 52.5″ (133 cm), while its height becomes 62″ (157 cm). The rear stabilizers can also be folded along the rail if needed. The fully assembled machine is not extremely heavy, despite its size. It only weighs approx. 81 lbs (~37 kg). This being said, it can easily be assembled by only one person. Also, once the unit is assembled, it’s very easy to relocate as its front base integrates a set of wheels. The machine offers an excellent stability. 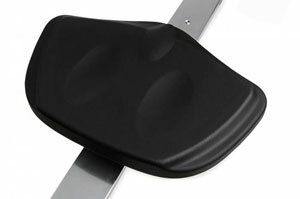 Both its bases integrate adjustable levelers with rubberized pad. Therefore, not only that you can perfectly level the unit on any type of floor, but the rubber on the leveler also provides an excellent grip on the floor. 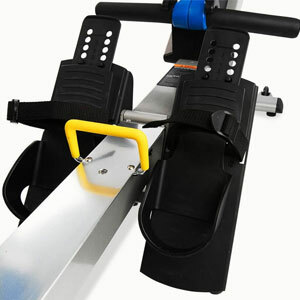 The rail of the XTERRA Fitness ERG700 is fairly long compared to the rails of other rowing machines. It provides approx. 50″ (127 cm) of travel for the seat. This being said, even users over 6’5″ (196 cm) should be able to get a full leg extension during rowing. It’s also durable enough to hold users up to 350 lbs (159 kg). This XTERRA Fitness rower features a fairly large seat (approx. 14″ wide). The seat does not integrate cushioning but does feature a contoured, anti-slip surface, delivering superior performance during rowing. The base of the seat is made of steel; along with the rail, the seat assembly can hold users up to 350 lbs (159 kg). It integrates three sets of rollers, two placed on top of the rail, the other under its top, in order to provide maximum stability. All the rollers integrate heavy-duty ball bearings for a smooth motion of the seat. They’re also concealed to maximize safety. When unfolded, the rail is completely horizontal. This being said, the top of the seat is placed at approx. 20″ (51 cm) above floor level. Therefore, it’s easy to take a seat or stand up, which can be quite a plus for users with certain disabilities or elderly users. The footrests combine steel and nylon elements. Evidently, their bases are made of steel in order to provide a hard support for each leg push. However, their top elements are made of nylon material, in order to provide ease of adjustment and a bit of flex with every stroke. They also have heel guards and velcro straps to keep your feet secure. The machine is equipped with an ergonomic handle. This element is slightly curved, in order to reduce stress on the wrists. Its grips are rubberized for optimal comfort. The handle is attached to a heavy-duty nylon strap. The material of the strap is highly resistant to abrasion. The strap can extend for up to 80.7″ (205 cm), so you can perform other exercises as well, not only rowing. 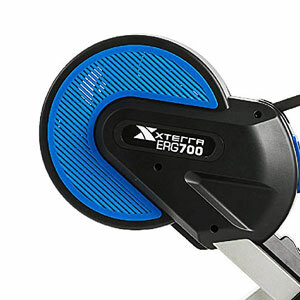 As we’ve mentioned above, the XTERRA Fitness ERG700 rowing machine features an air & magnetic resistance system. 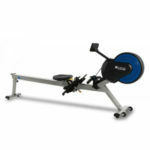 It’s equipped with a 7.7 lbs (3.5 kg) flywheel fan, which delivers a dynamic response during rowing. In other words, if you pull the handle faster, the air resistance generated by it will be higher. Therefore, the rowing feel generated resembles the rowing of a real boat through water, this being one of the reasons the machine can successfully be used by pro athletes. The internal magnetic resistance system consists of a small magnetic brake and a servo motor. This being said, the magnetic resistance is automatic; it can only be adjusted from the console, and if certain programs are in use, the machine will auto-adjust the magnetic resistance according to each segment of the program. Also, the machine needs to be connected to a power source for the console to become operational and for the magnetic brake to become active. The unit’s magnetic brake provides 16 levels of resistance. The first few levels are very light, and the main resistance is provided by the fan. However, the top resistance levels deliver quite a bit of difficulty, offering challenges close to professional athlete level. One last aspect to mention here regards the unit’s level of noise. Evidently, since it’s equipped with a flywheel-fan which generates air resistance, it does generate a bit of noise. 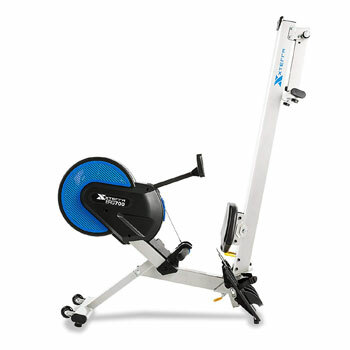 However, since the unit combines air with magnetic resistance, the level of noise is considerably lower than for a full-air rower. As a general idea, the noise generated is similar to a small electric fan. The XTERRA ERG700 is equipped with an advanced, programmable console, similar to the one included with the Diamondback Fitness 910r. To begin with, if has a 5.5″ diagonal LCD display which integrates blue LED backlight for superior visibility. Its display is divided into 8 distinct sections; therefore, you can view all the workout metrics at once, so you won’t have to use a scan mode to rotate them. The four bottom panels show your pulse, calories burned, watts, and the resistance level. The top panels show your strokes per minute, time, and distance traveled. And finally, the larger mid-section shows the profiles of the program in use. The rower is not equipped with any pulse sensors. However, the console has an internal HR receiver, so it can read your pulse through an HR transmitter. An HR chest strap is available for this unit, but not included. The console unit does not have Bluetooth connectivity, nor it is compatible with any online fitness apps. However, it has 10 built-in programs, plus the Manual Mode which allows you to freely adjust the resistance as you exercise. The 10 workout programs are Target Distance, Target Time, Target Calories, 20/10 Interval, 10/20 Interval, Custom Interval, Far Burn, Cardio Workout, Strength Workout, and Game Workout. For the first three Target programs, the unit gives you the possibility to select a goal value for time, distance, and calories. If a target is selected, the console will show the remaining value with each stroke until you reach that particular target. For the Interval programs, the first two are preset 20/10 and 10/20; in other words, these preset values require you to exercise for 20 sec and rest for 10 sec, or exercise for 10 sec and rest for 20 sec. The third interval program is Custom, so you can select the exercise and rest duration. The Fat Burn, Cardio, and Strength programs have a preset grid and give you the possibility to train in order to achieve a higher calories burn, improve your cardiovascular health, or improve your muscle strength. The last program is a Game which provides an obstacle course setting. Your position is represented by a three-dot line on the left, and “obstacles” come from the right, moving one row every second. Depending on how fast you row, the three-dot line can go up or down, the goal being to avoid as many obstacles possible. The front part of the rower that integrates the flywheel and the magnetic resistance elements comes fully assembled, with the console already attached. Therefore, you only have to attach the front stabilizer, the rail, the seat, the rear stabilizer, and the footrests. This shouldn’t take more than an hour. All the required tools are included. Also, the manual provides great, step-by-step assembly instructions. Internal maintenance is not required for the machine. Therefore, you only need to wipe the sweat from the frame after each workout session, and periodically check for loose bolts or parts, and re-tighten them if necessary. 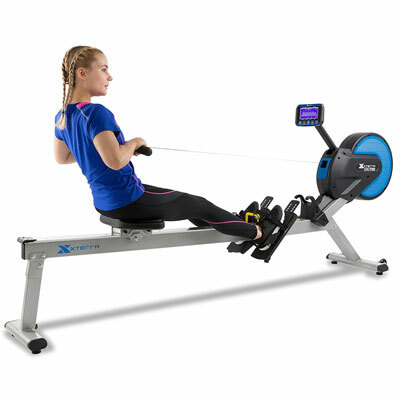 The XTERRA Fitness ERG700 is an air & magnetic rowing machine, offering 16 levels of magnetic resistance. It features a durable construction with an extra long rail, and an impressive weight capacity of 350 lbs. Also, its console offers 10 workout programs to keep you motivated. In all, it’s a great machine for users of all levels, perfect for a full-body cardio workout, interval workouts, weight loss, strength and stamina development, offering an excellent value for the price.